The Grand Hyatt is located right in the city centre with an easy access to the main attractions and is 30 kilometres from the airport. Enjoy contemporary decor with arabesque touches and one king or queen bed, or two twin beds featuring plush pillows, the softest of sheeting and duvet. Magnificent views welcome you to an elegant retreat offering every amenity, including marble bath with separate walk-in massaging shower, generous work area and high-speed Internet access. Enjoy contemporary decor with arabesque touches and one king featuring plush pillows, the softest of sheeting and duvet. Magnificent views welcome you to an elegant retreat offering every amenity, including marble bath with separate walk-in massaging shower, generous work area and high-speed Internet access. Enjoy contemporary decor with arabesque touches and one queen bed featuring plush pillows, the softest of sheeting and duvet. Magnificent views welcome you to an elegant retreat offering every amenity, including marble bath with separate walk-in massaging shower, generous work area and high-speed Internet access. Enjoy contemporary decor with arabesque touches and two twin beds featuring plush pillows, the softest of sheeting and duvet. Magnificent views welcome you to an elegant retreat offering every amenity, including marble bath with separate walk-in massaging shower, generous work area and high-speed Internet access. Enjoy contemporary decor with arabesque touches and one king bed featuring plush pillows, the softest of sheeting and duvet. Magnificent views welcome you to an elegant retreat offering every amenity, including marble bath with separate walk-in massaging shower, generous work area and high-speed Internet access. Includes daily buffet breakfast and evening cocktails. Enjoy contemporary decor with arabesque touches and one queen bed featuring plush pillows, the softest of sheeting and duvet. Magnificent views welcome you to an elegant retreat offering every amenity, including marble bath with separate walk-in massaging shower, generous work area and high-speed Internet access. Includes daily buffet breakfast and evening cocktails. Enjoy contemporary decor with arabesque touches and two twin beds featuring plush pillows, the softest of sheeting and duvet. Magnificent views welcome you to an elegant retreat offering every amenity, including marble bath with separate walk-in massaging shower, generous work area and high-speed Internet access. Includes daily buffet breakfast and evening cocktails. Enjoy an exclusive 72-sq.-metre suite offering master bedroom with king-size four-poster bed. Superb views of the pool and mosque or Old Amman welcome you to an elegant retreat offering every amenity, such as marble bathroom with jetted spa tub and walk-in massaging shower, guest bath, separate sitting and work areas, and high-speed Internet. Includes daily American breakfast and evening cocktails. Enjoy an exclusive 104-sq.-metre suite offering stylish living, dining and conference areas, and master suite with king bed. Superb views of the pool and mosque or Old Amman welcome you to an elegant retreat offering every amenity like marble bath with jetted spa tub and walk-in massaging shower, separate work area, and high-speed Internet. Includes daily American breakfast and evening cocktails. Exclusive 240-sq.-meter suite offers stylish living, dining and conference areas, 30-sq.-meter landscaped fountain terrace, and king four-poster bed. Superb city and mosque views welcome you to an elegant retreat with every amenity; kitchenette, bath with jetted spa tub and walk-in shower, separate work area and high-speed Internet. Includes daily American breakfast and evening cocktails. An exclusive 132-sq.-metre top-floor suite offers stylish living, dining and conference areas, and master suite with king four-poster bed. Magnificent city and mosque views welcome you to an elegant retreat offering every amenity, such as kitchenette, bath with jetted spa tub and walk-in shower, separate work area and high-speed Internet. Includes daily American breakfast and evening cocktails. Exclusive 382-sq.-metre suite offers stylish living, dining and conference areas, 107-sq.-meter landscaped fountain terrace, and king four-poster bed. Superb city and mosque views welcome you to an elegant retreat offering every amenity, such as kitchenette, bath with jetted spa tub and walk-in shower, separate work area and high-speed Internet. Includes American breakfast and evening cocktails. Choose from a wide selection of fine dining venues at Grand Hyatt Amman. The Grand Hyatt hotel restaurants range from Indochine, where the beauty and sensuality of 1930s Vietnam is captured together with the intricate flavours of exotic Asia; the Grand Hyatt hotel's Italian restaurant, L'Incontro, where Milanese chic is fused with innovative cuisine; and The Grand Café for lavish buffets. 32º North introduces a new lifestyle to Amman with it's cosmopolitan and sleek interior. From the impressive fibre-optic chandelier above the large, the beaded curtains at the round banquet seating and the exclusive leather dining chairs and clever glass walls, to the custom-made, free-standing kitchen, 32° North is a unique dining venue, more likely to be found in Manhattan, Sydney or London. This cosmopolitan restaurant boasts a grand marble seafood bar, serving the freshest of imported oysters, scallops, Alaskan Crab legs, lobsters, crabs, prawns and salads. The centre of the seafood bar features two giant oversized glass bowls, filled with a selection of champagne and vodka. Main courses are prepared in the custom designed, freestanding kitchen, which is an integral part of the interior design. All main courses are grilled on a charcoal grill and range from the freshest imported fish and seafood to specially imported Australian Mulwarra beef. A private dining room with floor to ceiling temperature-controlled wine cellars complete this exciting restaurant. L'Incontro, Grand Hyatt Amman's signature restaurant, is 'the meeting place' of Italian specialities, elegant ambience and Amman's trendy society, creating the most impressive Italian restaurant on this side of the River Jordan. Located in the west wing of the hotel Lobby, L'Incontro is vibrantly contemporary. The decor is truly Milanese chic, with all the furniture hand-picked in rich jewel hues with opulent fabrics and magnificent wallpaper-sized paintings reflective of Italian cities. The restaurant is fresh and full of light, with floor-to-ceiling windows overlooking the city and the restaurant's terrace. Inside, guests will surely be entertained by the live cooking show taking place in the theatre kitchen, where herb-accented chicken and juicy meats are being churned out of the wood-burning oven. Guests can sit around the bar and enjoy this true culinary spectacle while sipping a fresh espresso or smooth grappa. Those with a penchant for historical romance will thoroughly enjoy Indochine. The beauty and sensuality of 1930s colonial Vietnam is captured with louvre-paneled doors, wooden ceiling fans, woven furniture, a covered terrace, elegant palms and Asian art. An open theatre kitchen provides a lively culinary show and allows the wafting aromas of ginger and lemon grass to permeate the restaurant. The restaurant also has a private dining room, seating up to 20 persons, for personal and business occasions. The Grand Deli is a delicatessen in the true sense of the word, offering a variety of exclusive home-made as well as imported food and beverage, items for guests to enjoy at the shop or take out. The aroma of a delectable array of home-made breads, French pastries, fresh salads, sandwiches and mouth-watering cakes, prepared daily by our renowned pastry chefs permeate throughout the restaurant level of the hotel. Cafe tables outside The Grand Deli allow for a quick sandwich, pastry or brewed coffee. Located adjacent to the lobby, the imposingly fashionable Lounge, is the place to see and be seen. From the novel designer furniture and lighting fixtures to two large open fireplaces, floor to ceiling windows in the conservatory and a spectacular view, The Lounge is a truly exclusive and unique experience. The finest selection of exclusively imported teas, specialty coffees, cocktails and beverages together with a carefully selected range of snacks and viennoiseries are available throughout the day. Cool, breezy and flirty, The Terrace is the ideal place to unwind after a long day. Escape to an exclusive and divine new environment and be seduced by the sensations that await you…cool sofa seating, sleek cocktail bar, soothing water features and majestic landscaping. Chill out whilst listening to the trendiest of music. The largest variety of freshly squeezed tropical juices, iced teas, speciality cocktails and novel snacks provide an optimum choice for every mood. The Grand Ballroom makes a dramatic first impression on your guests. With 904 square metres of space, the ballroom complex accommodates up to 1000 guests theatre style. The Grand Ballroom is divisible into three soundproof sections - the Iris, the Orchid and the Jasmine. The Jasmine section features a built-in stage. A dedicated professional is on hand 24 hours to assist in supervising the large variety of electronically controlled lighting set-ups and audio-visual equipment. The soft tones and subtle design make it easy to transform to the atmosphere of your choice. Events may be extended to include the lush garden courtyard - refreshingly perfect for pre-function activities or breakout sessions. Seven meeting rooms offer a choice of venues for business seminars, private meetings or intimate dinners. The seven meeting rooms are named after the seven distinguished pre-Islamic poets - Labeed, Amr, Zuhair, Umru', Tarfah, Antarah and Al-Hareth. Each of the meeting rooms features a silkscreen print by renowned artist Dia Azzawi, called Al Mu'allaqat (Hanging Poems), paying tribute to the respective pre-Islamic poet. The Al-Hareth meeting room reflects the comfort of a 'drawing room' atmosphere and features an open fireplace, bookcases and cosy couches. The design of all the meeting rooms is luxurious, contemporary and reflective of the local culture. The three separate boardrooms offer a different and more exclusive setting, featuring fixed wooden tables suited for board meetings. Boardroom 1 offers a seating capacity for 12 persons and is equipped with cutting-edge audio-visual equipment including built-in fixed rear projection, fixed front projection and colour touch active matrix. Boardrooms 2 and 3 offer seating capacities for eight and ten persons respectively. Sit under a blanket of stars and rejuvenate with the cool summer breeze at Sawani Terrace, offering the perfect venue for your corporate events, weddings and engagements. Bask in the beauty of nature and relax, for our terrace is a fantasy summer garden that is sure to bring you pleasure. The exhibition facilities at Zara Expo consist of three purpose-built exhibition halls providing almost 3000 square metres of high-quality, air-conditioned exhibition space and a 297-seat Conference Auditorium. Each exhibition hall has its own foyer with organisers' offices and a dedicated registration desk, as well as underfloor service channels for single phase and communication services. The halls are an ideal space for themed events, sound and light shows, product launches and unique dinners for up to 700 guests. They can be used together for large events or rented individually. A 297-seat Conference Auditorium is located above the exhibition halls, which can be used as a main conference auditorium, theatre, concert hall and cinema or lecture hall. It has its own foyer / reception area, six breakout rooms alongside the auditorium, as well as an administration office for organisers. Holistic treatments that rejuvenate the body and mind are available from professional therapists. Treatments range from Dead Sea mud wraps, facials using natural marine products and traditional hot stone massages. Reap the rewards of optimum health, beauty and well being at the luxurious Club Olympus, Amman's premier fitness and leisure facility. Located on the first floor, Club Olympus is an exclusive health and fitness sanctuary designed to enhance the well-being of its guests. The well-equipped gymnasium offers a full range of fitness training equipment. These include treadmills, life cycles, cross trainers, free weights and strength machines. Each running machine is equipped with a personal television, DVD player and headphones. Fitness professionals are on hand to help design an exercise program to suit your requirements. A sauna, steam room, Jacuzzi, indoor and outdoor pools, with separate male and female wet areas, complement the feeling of well-being. In the evenings, the indoor pool features and illuminated ceiling that gives the sensation of swimming beneath the stars and provides the ultimate feeling of relaxation. The 18-metre-long indoor lap pool is the perfect place to stretch one's muscles and relax at the same time. The indoor pool is located in a fantasy sky-blue room with a shimmering, starlit ceiling, which has a huge floor-to-ceiling window overlooking the celebrated King Abdullah Mosque. 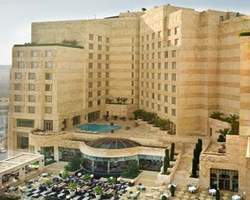 For those who prefer to drink in the warm Jordanian sun, the 13-metre-long outdoor pool is the place to be.